#bare hands, #determine, #find, #find North, #time, #Sunset, #Sunrise, #time to Sunrise, #time to Sunset. Finding time to Sunset with bare hands (Blog No. 11). There are times when you have no watch or when it is not practical to carry a watch (such as when going for a swim in the sea) and you need to know the time from Sunrise or to Sunset. This time can be determined reasonably accurately using only your bare hands. Figure. 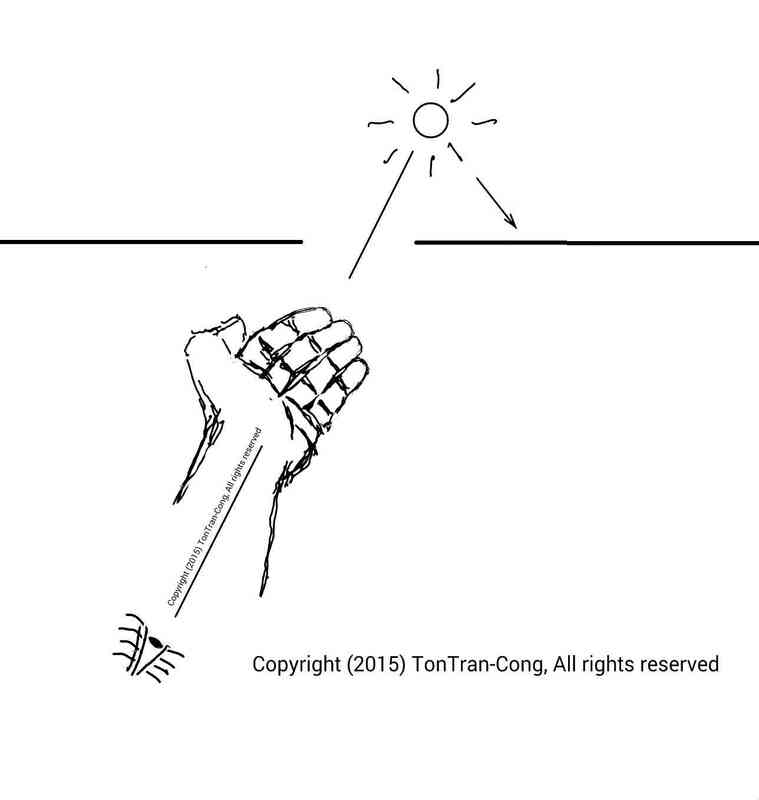 Hand posture for determining time to Sunset in the Northern hemisphere. Cup your hand as if about to hold water. Position the wrist to have the thumb on top with four fingers horizontal and close together. Then stretch your arm, keeping all fingers at right angle to the stretched arm. Stand with your chest facing the Sun but DO NOT LOOK INTO THE SUN. Interpose the bent fingers on your stretched arm between the Sun and your aiming eye on the same half of your body. Twist the stretched arm to have the bent fingers forming with the horizon an angle equal to the local latitude angle and the contact line between middle finger and ring finger being on the same plane with the Celestial axis (Tilting the fingers from the horizontal by an angle equal to latitude angle is close enough). The Sun will travel at right angle to your fingers to its setting position on the horizon . Count the finger widths from the Sun to its setting position. Each finger width is about 1.5 degrees distance and is equal to 1.5×4 = 6 minutes of time to setting on equinoxes or is equal to 6.6 minutes of time to setting on solstices. (At solstices, the length of the trajectory of the Sun is only (6.24radius)x cos(23.5degrees), so each 1degree of length corresponds to 4.4minutes of time). For example, four finger widths to setting point gives 4×1.5×4 minutes of time to setting at equinoxes or 4×1.5×4.4 minutes of time to setting at solstices. 1/- In the Northern hemisphere the Sun moves to the right (North) when setting. 2/- In the Southern hemisphere the Sun moves to the left (South) when setting. 3/- The Sun is between the middle and ring fingers if any small gap between them let through strong rays of light. 4/- Your finger width on your stretched arm may sustain an angle different from 1.5 degree. You need to check it against the diameter of 0.5 degree of the rising or setting Moon. 5/- In Northern hemisphere, the Sun rises to the right (South). 6/- In Southern hemisphere, the Sun rises to the left (North). Finding directions and time using the Sun and a divider., posted on May 6, 2015.